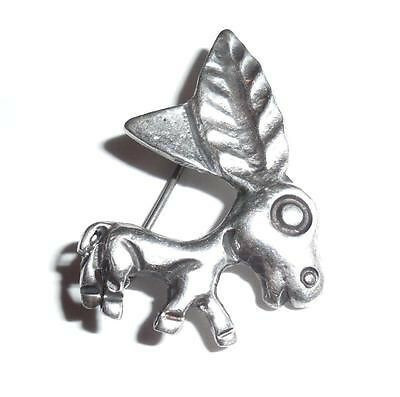 Vintage Mexican Sterling Silver Donkey/Burro Pin. Tested and Guaranteed to be solid sterling silver....Not plated. Old Marking - Silver, Made in Mexico. Prior to the institution of the eagle marking in 1952 by the Mexican Government to assay sterling silver this mark using just the words "Mexico Silver" was the assay for sterling silver. Pre 1952. Additionally, this item has be jeweler tested and is Guaranteed to be solid sterling silver. It is Hand Cast, Hand Cut, Hand Finished. Very Well-Made. Overall Condition is excellent. Size is small measuring 1 1/8"north to south by 7/8" across east to west is 7/8". 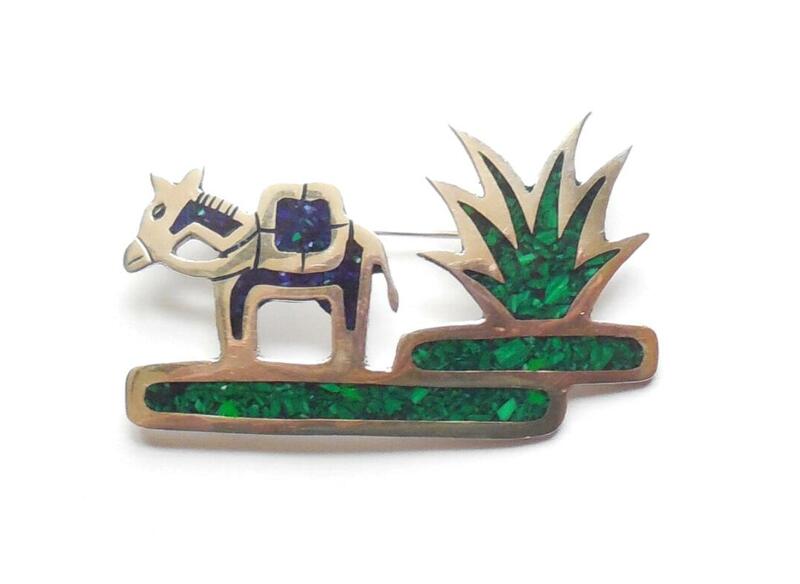 This is a lovely, adorable donkey pin for your vintage Mexican Silver jewelry collection. Mid century hand made Scandinavian Albert Scharning of Norway blue enameled on sterling silver double leaf pin. Marked A. SCH. (Alber Scharning) marking, Sterling, Norway. The front has gorgeous brilliant royal blue French Guilloche enameling in a linear pattern and the back has a very faint light gold wash. Excellent overall condition. Size: Large 2 1/4" tall by 1 1/16" wide. Weight: 9.5 grams. A lovely vintage statement pin by a known maker of Norwegian Scandinavian jewelry for your collection. In crisp, mint, original finish condition this is a gorgeous example of vintage Van Dell 1960s sterling silver jewelry. It is a 3 leaf mid century modernist wild berry cherry leaf pin. Guaranteed solid sterling silver, the back is Signed Van Dell and also marked Sterling. It is in incredible condition still having its original mirror finish and crisp 1960s fancy Florentine brushed finish to the sterling silver. The design is very smart and incorporated a rounded top stem to which a large removable ring clasp bail loop and chain can be added so it can be used as a necklace. Weight is 5.1 grams. Size is 2 1/8" by 1 3/8". 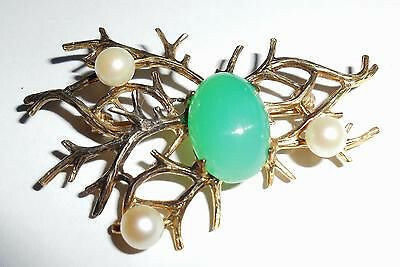 This is a lovely vintage mid century statement pin for your collection. 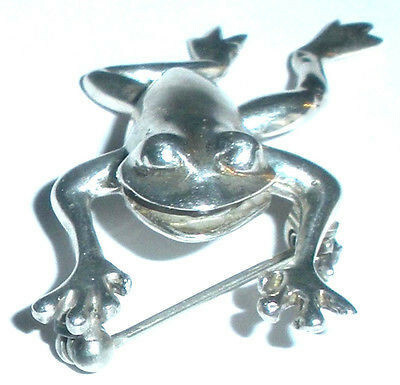 This is a showy hand made sterling silver pin of a very, very happy movable frog. marked tested and guaranteed to be solid sterling silver. Hand made and hand riveted. The legs dangle back and forth. Size is 1 15/16" from toe to toe by 3/4" across the leg joints and 7/8" across the arm joints. Weight is 9.1 grams. Excellent condition and very well made. 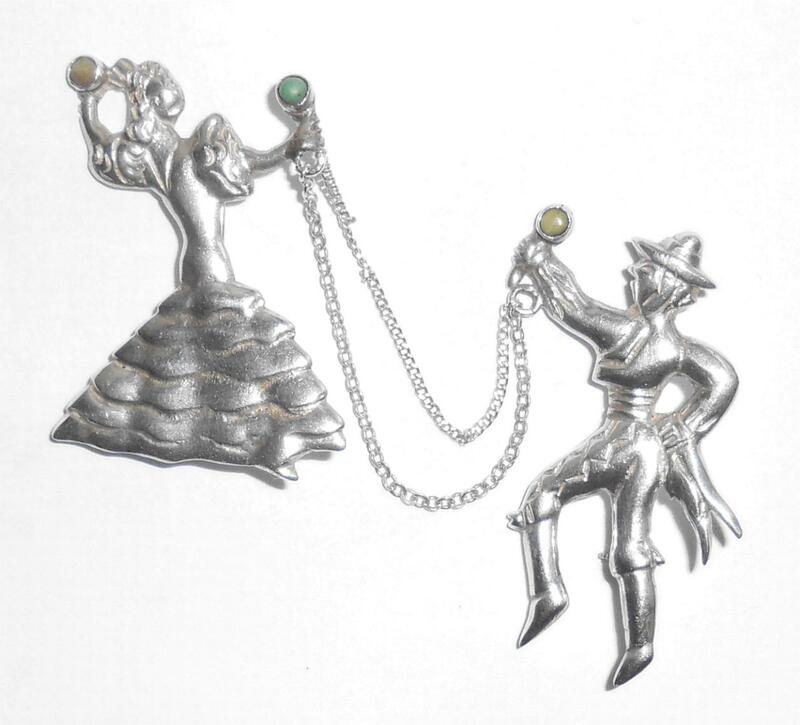 This is a lovely original pre 1950s late Art Deco vintage Mexican sterling Silver man and woman twin Flamenco Dancer Duette pins. They are beautifully made with thick, solid sterling silver and detailed hand casting. The male has old pre 1950s markings of Plata, Sterling. Additionally, both are jeweler tested and Guaranteed to be solid sterling silver. Each dancer holds castanets made of natural mined turquoise cabochon stones in their hands. Size of the man is 2" tall by 1" wide from the knee across. The woman is just about 2" tall by 3/4" midway down her dress skirt. Weight is 18.3 grams. Nice to find the original pair together and in this condition. This is a lovely pair of vintage Flamenco dancers with early markings in excellent condition for your vintage jewelry collection. 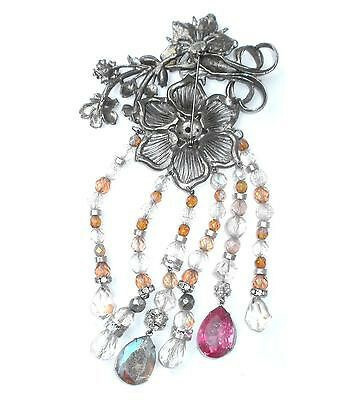 This is an absolutely stunning and VERY RARE Thelma Deutsch antiqued silver 6 long dangles pin with amber, white and AB rhinestones, rhondelles, REAL crystals etc....Thelma Deutsch made very flashy high quality constume jewelry for ONLY 15 years from 1980-1995. Dangles and bracelets are extremely hard to find. Direct from an estate and it has not been cleaned or touched. Size is 7 1/2" long by 3 1/2" wide across. This is a super rare Thelma Deutsch estate find pin for your collection. 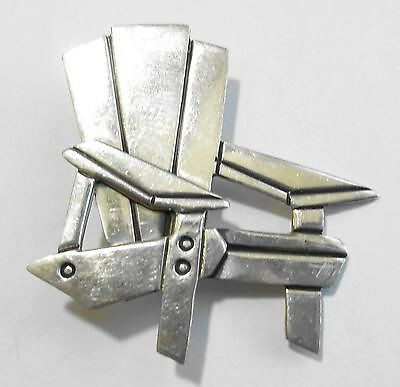 Retired Far Fetched sterling silver stylized Adirondack chair pin. Whimsical Jewelry. Marking: Far Fetched 925 for sterling silver quality. Construction: Handmade Artisan Jewelry, High Quality, Thick and Very Well Made Size: 1 1/2" tall North to South by 1 1/2" wide across the center. Weight is 7.6 grams. Condition: Excellent, used. 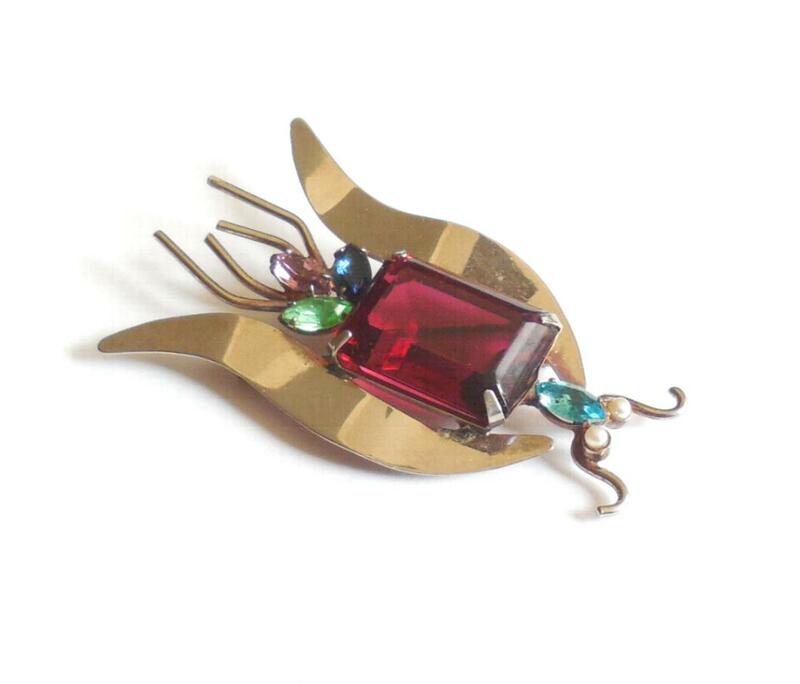 This is a great big showy Art Deco retro sterling silver insect pin with rhinestones and a large ruby glass center. It is Marked Sterling. Also tested and Guaranteed solid sterling silver. As it has some light remnants of a light gold wash it is original vermeilled jewelry from the 1930s. Most of the gold wash has worn with age. It has all around light age wear. It is also handmade. If you look at the photos you can see the soldering joints near the bottom of the prongs for the red glass stone and in the same places in the back. All of the stones are bright, clear, deeply colored. No cracks, chips, nicks, flakes, or abrasions. All good stones. The sterling would look great with a professional jeweler polish. Other than this, it is in excellent condition. Very geometric in form it is readily identifiable as Art Deco Retro period. Size is large at 2 7/8" long by 1 1/2" wide across. Weight is 20.3 grams. 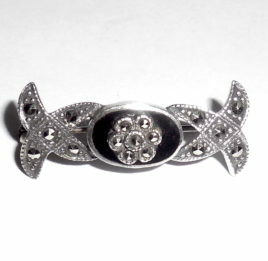 This is a lovely and highly noticeable statement pin for your vintage art deco or insect jewelry collection. Very stylized in form. 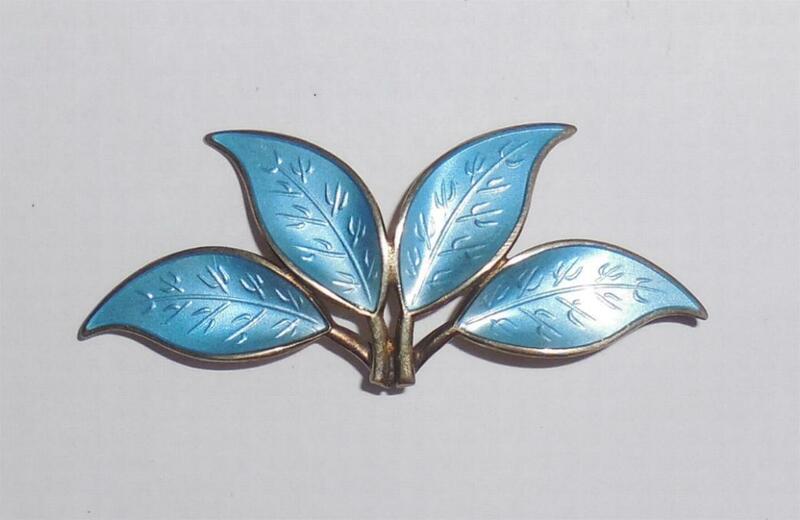 This is a large vintage mid century Scandinavian David Andersen sterling silver quad or 4 leaf enamel pin. Marked with 2 hallmarks, DA, 925 S, Sterling, Norway. Size is almost 2 9/16" wide by about 1 1/4" North to South. 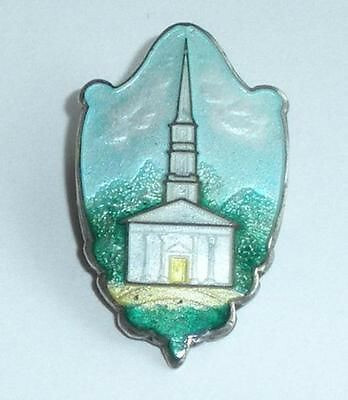 It is beautifully made with very pretty blue enameling and a gold overlay on the back. In excellent condition, this is a lovely large vintage statement pin by a well-known maker for your collection. 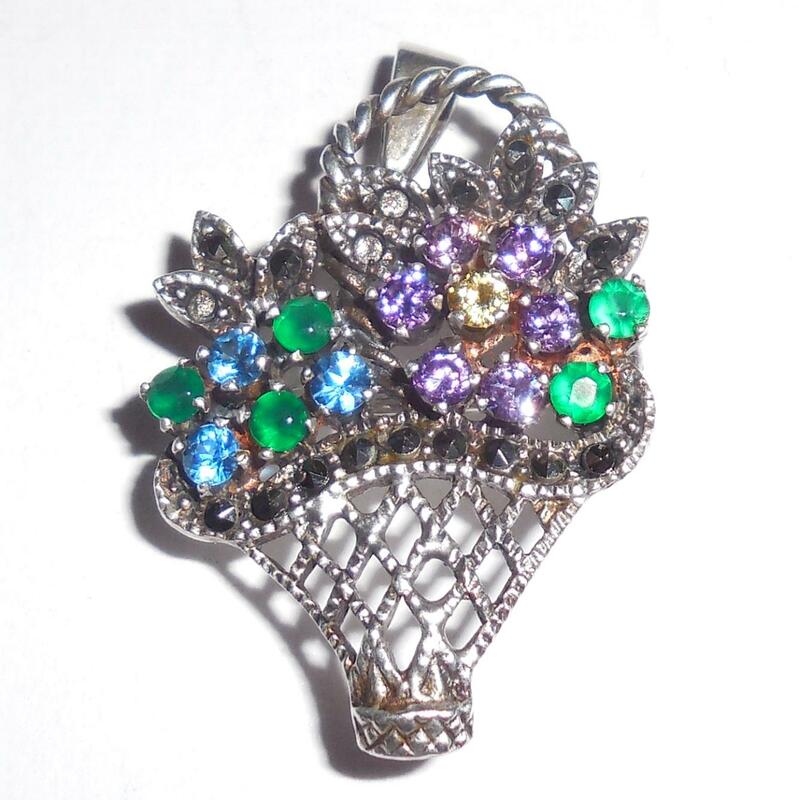 Sterling Silver Marcasites Crystals Basket Pendant Pin Metal: Sterling Silver Marking: Hallmarked, Maker Marked, Also tested and guaranteed Stones: Open Back Prong Set Original Swarovski Austrian Crystals with deep rich emerald, amethyst, citrine, and blue topaz colors. Material: Cut faceted sparkly steel marcasites Size: 1.25 inches tall north to south not including the bail by 7/8 inch wide across east to west Condition: Excellent, gently used. This is an extra large, thick, vintage, handmade, Mexican Sterling Silver mosaic pin inlaid with malachite and sodalite/lapis stone. It is marked Mexico, N-44, 925. Size is extra large and measures 2 9/16″ long by 1 5/8″ wide north south on the cactus and 1 1/4″ wide north south on the donkey. Weight is Heavy at 17gr. The hand crafting is lovely with a very pretty mix of stones. From the back one can see that the sterling is hand wrought. All of the mosaic work is full and smooth with a thickly applied laminate finish so that all of the mosaic will always stay intact. Condition is excellent, gently used having only light faint surface scuffs to the silver that are Not eye obvious at all when the pin is used. All mosaic is intact. No dents, dings, tears, chips, deep scratches, gauges etc...No wear to the stones. Never repaired or altered in any way. Completely original. 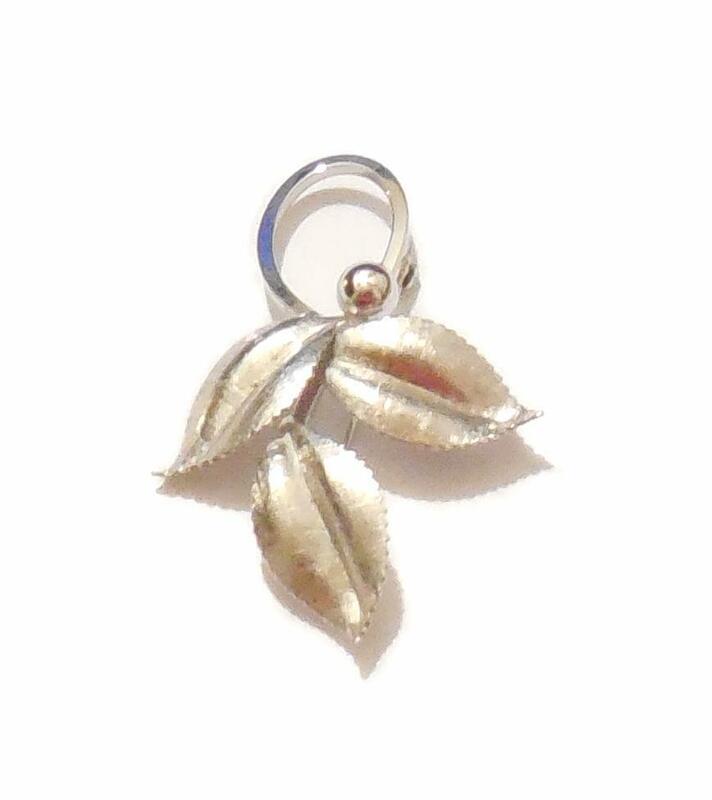 This is a gorgeous big, showy, well made pin for your Mexican Silver jewelry collection. This is a vintage Art Deco gold over sterling silver pin with a large 14m jadeite cab stone in the center and 5.5m cream white natural cultured pearls. It is marked, tested and Guaranteed solid sterling silver. The jadeite has an inclusion/hairline crack. Weight is 7.5 grams. Size is 1 7/8" East to West by 1 1/4" across the widest points North to South. 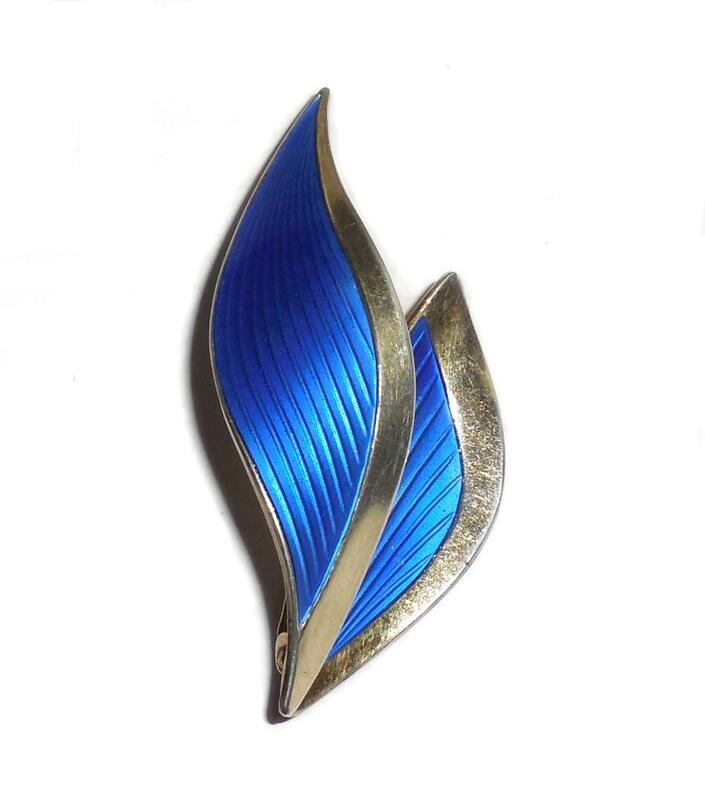 Gorgeous showy 1940s late Art Deco pin for your lapel!! This is a lovely vintage 1950s poodle jewelry dangle pendant of solid sterling silver with enameling on the poodle. It is marked with European Italian Origin Hallmarks as well as 925 for sterling silver quality. All parts are also tested and Guaranteed solid sterling silver......Not plated. The original owner used a fancy carved late Art Deco Long Sterling Silver bar pin to which the silversmith attached a loop bail. Attached to the loop is a thick dangle bail which has the mid century Italian sterling silver hallmarks. See photo. The poodle is very thick, solid, strong, and well detailed with fine deep recesses. It also has a green enameled collar, black enameled eyes, and a bright red enameled tongue. This poodle is very fancy, well-made, and sits freely. The back is flat so it sits nicely as it dangles from the bar pin. Size is 1/8" tall north to south from top of bar to bottom of poodle by 2 1/8" wide east to west across the bar pin. The width across the poodle floppy ear to floppy ear is 9/16" and the width across the bottom is 3/4" from the tail to the front leg. Weight is 7.9grams. Condition is excellent, very gently used. No damage or repair. No dents or dings. No tears or deep scratches. 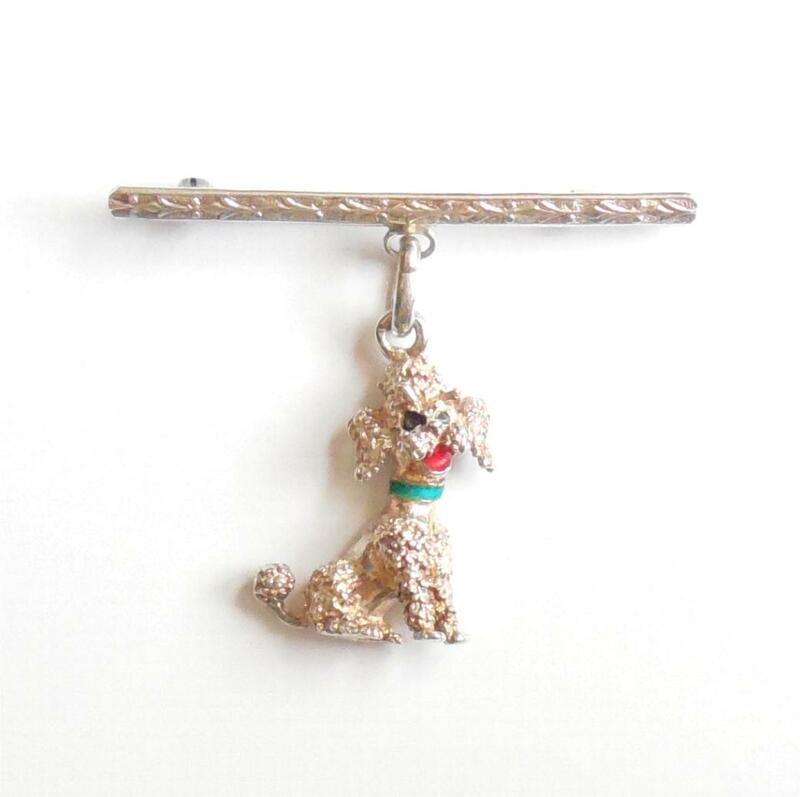 Indicative of an era long gone by this is a beautiful, unusual hanging poodle pin for your vintage mid century jewelry collection. This a vintage Taxco Mexican sterling silver late mid century modernist cat/kitten pin with a bold, stylized design. It is marked Mexico, 925 for sterling silver quality and has 1970s-early1980s Taxco marks of TT-23 with the T to indicate Taxco origin and the maker. It is also jeweler tested and Guaranteed solid sterling silver. Weight is heavy at 13.2 grams. This was made during an era where it was more commonplace to use thick, solid, strong sterling silver. Quite thick, substantial and durable. Size is 1 9/16″ tall from top of tail to bottom of paws by 1 1/2″ long across. Condition is excellent, gently used having light age scuffs. Minor surface wear only. No dents or dings. No alterations or repair of any kind. No gauges, tears or deep scratches. Completely original. Minor surface wear only. 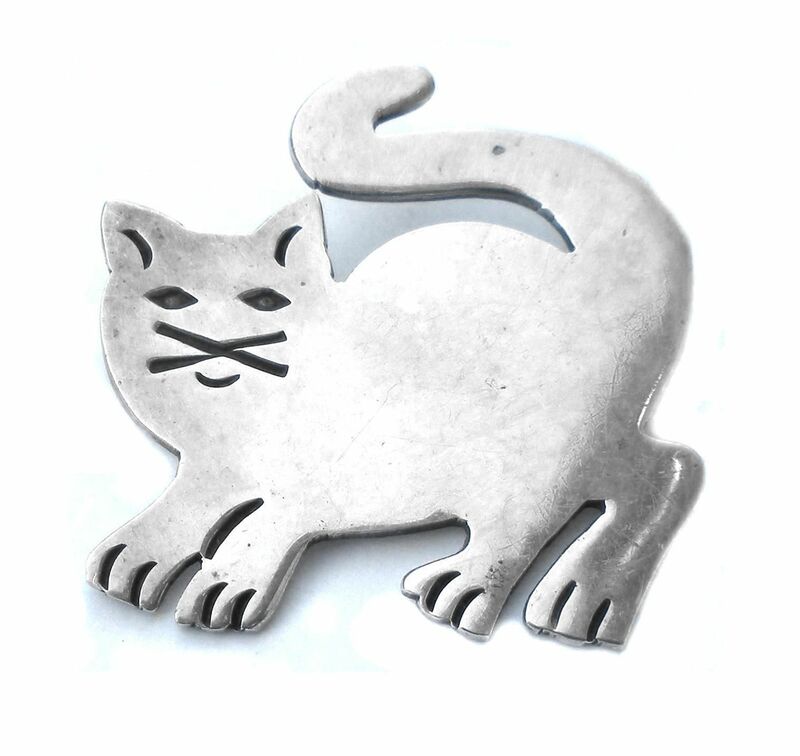 This is a gorgeous, heavy mid century modern cat pin for your collection. Will look great with a fresh polish. Nice, heavy sterling silver thickness. Will last and last. This is a very fancy long vintage 1950s Holland 835 silver filigree Delft Blue and White porcelain tile pin. It is Hallmarked 835 on bottom front and hallmarked inside back rim. Additionally, it is tested and Guaranteed to be solid 835 Netherlands Silver. It is long and quite showy with a very detailed twist to all of the filigree open work. Size is 1 15/16" by 11/16". It has a good locking clasp and is easy to wear. Excellent condition. Very gently used estate jewelry. No damage. No repair. All original. Signed. Hallmarked. Never altered in any way. Well made with a thick bezel and good locking clasp. 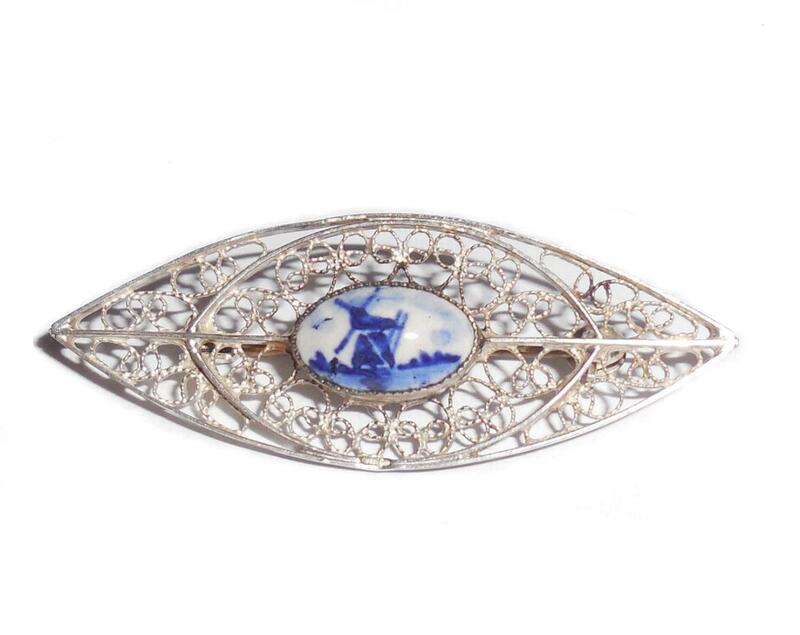 This is a beautiful vintage lacy filigree pin with very fine intricate detail and a handmade Delft tile for your vintage jewelry collection. 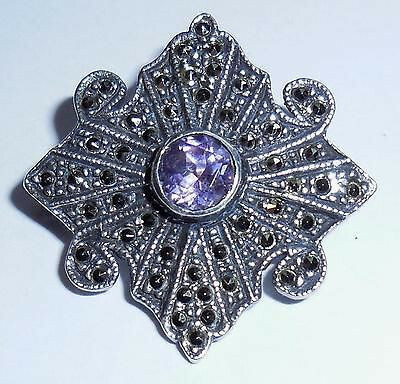 This is a vintage 925 sterling silver and faceted marcasites pin with a bezel set amethyst in the center. Marked 925, tested and Guaranteed solid sterling silver. It is in excellent, ready to wear condition. The amethyst has no chips, cracks, flakes or wear marks. The sterling silver has no tears, deep scratches, dents or dings. It has a good clean casting; nice thick sterling silver. Good quality workmanship. All marcasites are set evenly and properly. Size is 1 1/8" across. The locking mechanism is strong and secure. This is a lovely, very well made pin for your collection.